Scuba diving mask is an essential piece of kit you can't do without. Be sure to choose the right one. A scuba diving mask is an essential piece of kit you can’t do without. 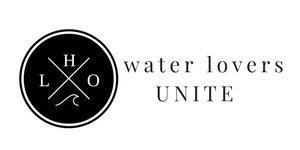 Although you will be able to rent essential equipment if you are new to scuba diving, it makes sense to buy your own kit if you plan on diving regularly. We also recommend a GoPro and GoPro mount for diving, if you are outfitting yourself. Investing in a good quality, well-fitting mask will make life more comfortable when you are underwater, so what qualities should you be looking for and how can you ensure you buy the right dive mask? Why Wear a Dive Mask? We can swim underwater without a mask–people do this all the time–but it is impossible to focus properly in water, which is why scuba divers wear dive masks. A well-fitting dive mask creates a pocket of air across your eyes and nose and lets you see clearly while you are diving. So you get to see everything in great detail, which is useful if you happen to spot something dangerous swimming towards you at a rate of knots. Avoid cheap diving masks at all costs. They may be okay for messing around on holiday, but low-cost brands may not be comfortable or even safe to use. A diving mask is one of your most important pieces of equipment and without one you can’t dive, so don’t cut corners by picking up a cheap and cheerful supermarket ‘bargain’. Cheap masks are made with cheap components–rubber and plastic as opposed to silicon and tempered glass. Rubber doesn’t seal as well as silicon and plastic and non-tempered glass can crack under pressure. Ever tried swimming with leaky goggles? If you have you will know what a nightmare it can be. Instead of cruising up and down the pool in a relaxed fashion, you spend most of your time tipping water out of your goggles. A leaking dive mask is no less annoying, which is why you should look for a good quality face mask with a silicon seal. Silicon molds better to the face than rubber and creates a tighter seal. Silicon also ‘remembers’ your face shape and this is a very good reason why buying your own dive mask is far better than hiring one. The only way to find the right dive mask for your face is to try a few on for size. Once you have established that the dive masks you are considering are made from good quality materials (purchasing kit from a reputable store will help to ensure this is the case), pick a few masks that you like the look of and try them on. Dive masks come in several different designs to suit a variety of different face shapes, so what works for one person might not be a good fit for another. Dive masks should seal without needing to be strapped on. To begin with, place the dive mask over your face and press it gently in place whilst making sure you don’t have hair breaking the seal. Does it feel comfortable? If so, adjust the strap and jump around to make sure the seal holds. Remember, the straps shouldn’t be pulled too tight as this may bend the mask and break the seal. 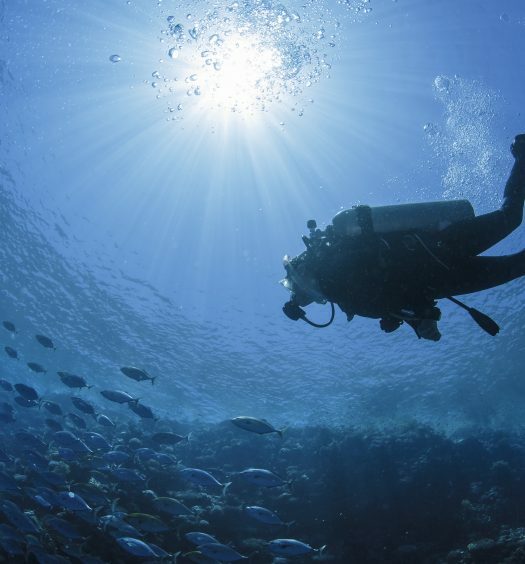 If you routinely wear contact lenses or glasses, you may need to buy a prescription scuba diving mask. Whilst it is possible to wear contact lenses beneath a scuba mask, it is not advisable because if the mask leaks at any point you run the risk of picking up an eye infection. You could also lose a lens if your mask floods. 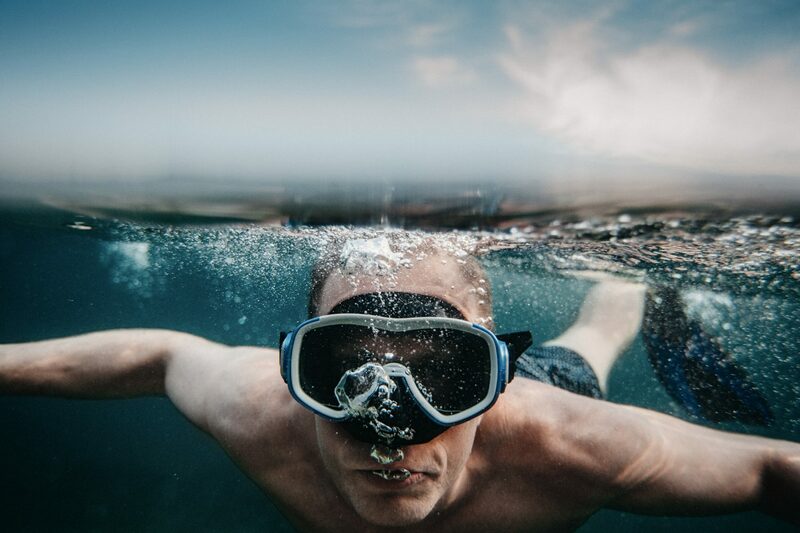 Dive shops often stock prescription lenses that can be fitted to dive masks (a corrective lens is attached to the glass plate of the mask), but you can also buy them online. Once you have found the right dive mask, if you look after it carefully it will last for years. Masks should always be rinsed after use to remove any residual salt. Do this with warm fresh water and if your mask needs cleaning, use a small amount of mild detergent. Leave the mask to dry somewhere warm, but don’t leave it sitting in the full sun for hours. 1 Why Wear a Dive Mask?